Only 2 miles from North Conway, Echo Lake State Park offers some great running opportunities. There’s a perimeter path around a lake, a 1-mile auto road, some trails in the woods, and an opportunity for a more challenging trail run up White Horse Ledge. White Horse Ledge may be the signature trail run of the White Mountains region. Enter via Echo Lake State Park for a ~3 mile loop with longer options, depending on your stamina. 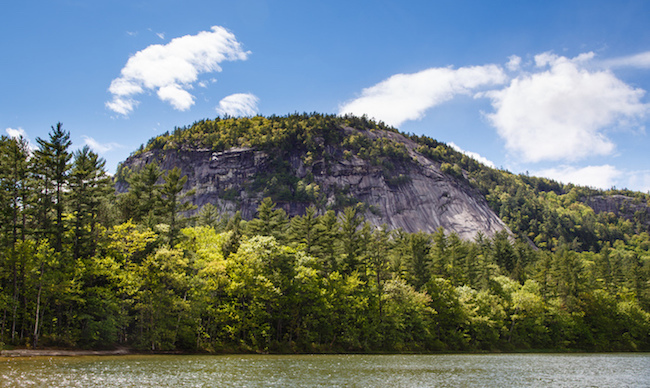 The trail from Echo Lake will take you around the perimeter of the 15.7 acre lake before rocketing you up the granite ledge with sweeping views of the valley below. As a bonus, the lake has a small swimming beach, so you can cool off on your return trip. It’s totally worth the work, but beware: during peak hours and seasons, this popular trail gets jammed with hikers and rock climbers. Park at the Echo Lake Trailhead and follow it until Bryce Path connects you to the White Horse Ledge Trail (which will loop you back). For an alternate route, hop directly on Bryce Path from the Cathedral Ledge Road. 929 feet in only 2.7 mile loop!